High visibility, durable construction, and enhanced mobility distinguish this affordable vest. Our Cruiser Life Jackets are designed to keep crew that have gone overboard visible and securly afloat. 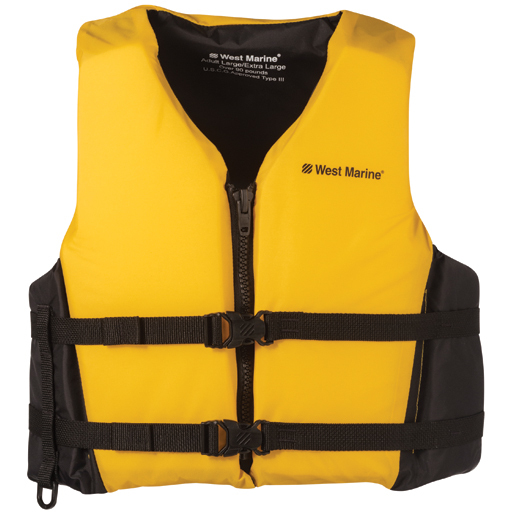 These life jackets feature a heavy-duty nylon outer shell that is durable enough to withstand the elements. A full-zip front and two buckle closures adjust for a secure fit. Lightweight, polyethylene foam ensures dependable flotation. Segmented hinge points and large armholes allow for maximum movement, while the brightly colored yellow outer shell helps to ensure that you will be seen if you happen to land in the drink. Cruiser Life Jacket, S/M, Chest Size 32"-40" Cruiser LifeJacket, L/XL, Chest Size 40"-48" Cruiser Life Jacket, 2XL/3XL, Chest Size 48"-56"
Cruiser Life Jacket, S/M, Chest Size 32"-40"